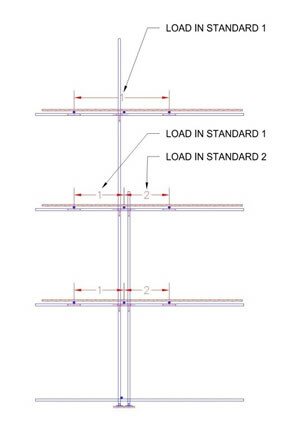 In scaffold design when we reach the leg capacity (strut capacity for the effective length see ‘What is Effective Length’ post linked below) we have several options open to us such as reduce the loading, reduce the bay sizes or introduce double standards and try to spread the load. For instance, lets assume we need a 40m scaffold, in 2m bays, 5 boards wide, 0 inside boards, a type D tie pattern, with 2m lifts and supporting an imposed live load (see ‘What Is Live Load’) of 2 kN/m2 on 1.5 working lifts. Depending upon your approach, the leg load generated under these conditions at ground level would be circa 15.9 kN and 23.2 kN on the inside and outside lines respectively. Referring to TG20:08 Table 20 we are advised a Safe Axial Load of 18.2 kN for an Le = 2.7m. Immediately we can see the outside leg fails and if we cannot reduce the load or bay size then we have to install an additional standard. To understand more closely how double standards work we have to look at the load path through them. It the diagram below we can see on the top lift the standard takes the entire load of a bays width – ½ to either side. When we introduce a second standard in the conventional manner of strapping it to the ledger with doubles we are now halving the load picked up by the original standard with the remainder going in to the second standard. When we look at this accumulatively, we can say all the lifts with double standards are spreading their self-weight (weight of tubes & boards) equally down each standard. However, as the original standard goes full height, this standard in addition to picking up half the weight up to the height of the double standards now takes the full load of the scaffold above. It is important to recognise we are not making the standards stronger! The capacity of each is still as before ~ 18.2kN, but we have been able to dump some of the load in to a second standard and by doing so we still have some capacity left for the initial standard to go higher. It is important to recognise however, double standards are not very effective in dumping load as the initial standard must still take the full weight of scaffold above the double standards dying out. This is important when we now think about the Live Load. Typically most scaffolds are loaded on the top lifts and as such the Live Load component of the leg load could all be in the single standard. In the above example, 21% of the single leg load capacity is used up by the Live Load component. By running an accumulative leg load build up we can now see for the above example, double standards would be required up to the 11th lift with the top 9 continuing as a single standard.